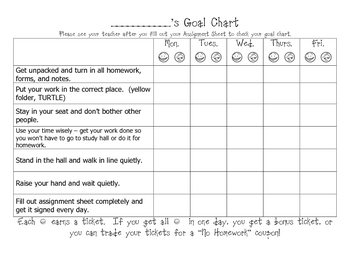 Use this chart to help students keep track of their classroom behavior and work habits. It uses a reward system of earned smiley faces to help motivate students into positive habits. This is now a ZIP file, with both pdf and word versions, so you can customize it. BEWARE: If you don't have the same fonts as the ones I used, the formatting will need to be tweaked in the word version. Thank you to the buyers who gave me suggestions! !